Paint the Town Studio's new pottery class program was reported on by GreaterPatchogue. Hauppauge Reporter and Long Island Business News reported on Gershow Recycling's donation and sponsorship of Play For Peace. Gershow also helped lead a tour of the recently constructed wind farm off Block Island. This was reported on by the Long Island Herald. Ben's Kosher Delicatessen recently celebrated its 45th Anniversary; this was reported by Good Times Magazine and WestChester Magazine. McPeak's Assisted Living celebrated National Assisted Living Week; this was reported in the Hauppauge Reporter. Star Island Yacht Club owner Sam Gershowitz was recently profiled on the CNBC show Secret Lives of the Super Rich. Charles Rutenberg Realty added new agents in October; this was reported by Long Island Business News. Newsday.com featured the School-Business Partnerships of Long Island, Inc FIRST Robotics Competition team "Girl Power Robotics" in its back-to-school article. Gershow Recycling presented scholarship checks to select graduating Long Island high school students; this was reported on twice by Long Island Business News. McPeak's Assisted Living recently celebrated Assisted Living Week; this was reported in Newsday's Hometown Shopper. 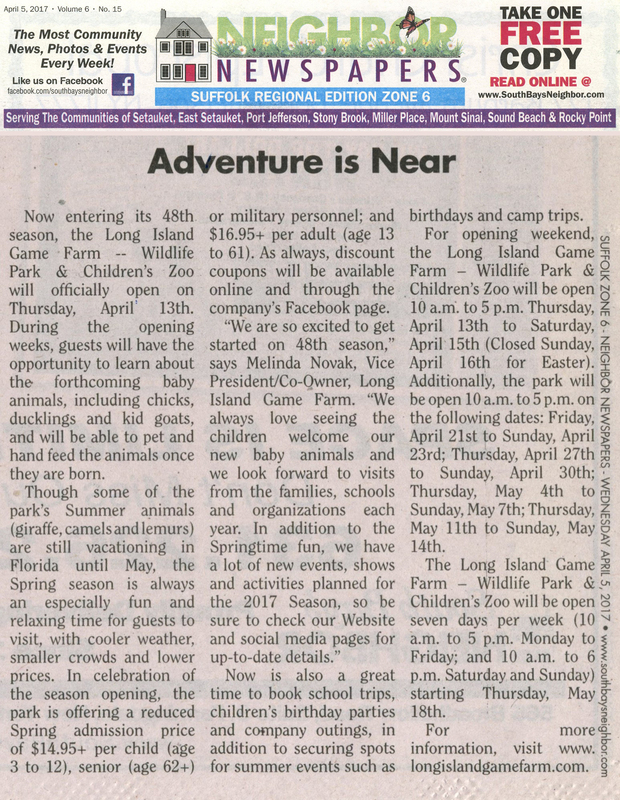 Newsday listed the Long Island Game Farm as one of its summer fun destinations, and featured the Zoo in its enewsletter. Newsday included Lobster Roll Restaurant in an article on the "must-eat lobster rolls" of Long Island, and featured Lobster Roll in its enewsletter. Charles Rutenberg Realty (CRRLI) continued to add agents over the past month. These announcements were reported in Real Estate Weekly. Newsday reported the Long Island Game Farm as one of its top 36 things to do on Long Island article, and featured the Game Farm in its enewsletter. Don Caroleo of The Garden Dept. was quoted in a Credit.com blog on how to save money on your summer garden. This was picked up by the St. Louis Post-Dispatch, Huffington Post and MSN Money. FiOS1 interviewed Mr. Caroleo on the effect that green gardening is having on the landscaping industry. The Village of Old Westbury launched a "Smart" water meter pilot program to teach homeowners about water usage and conservation. This was reported in Newsday and The Island Now. Steve Levy of Common Sense Strategies appeared on LI News Radio to discuss illegal immigration and voter fraud. 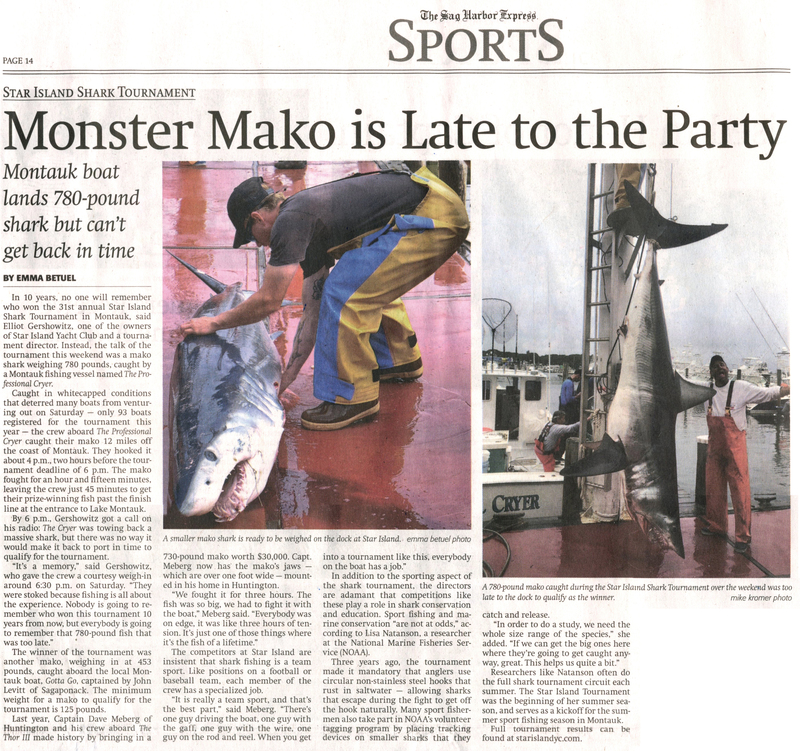 Shelter Island Reporter reported on the Star Island Yacht Club's Annual Shark Tournament and Neighbor Newspapers reported on its Mako, Thresher & Tuna Tournament. Newsday's ExploreLI section included Star Island Yacht Club in an article featuring the best locations for children to go fishing. PRMG assisted The Office of Legislator Rob Calarco in promoting his Ninth Annual Play for Peace/Jugando Por La Paz Soccer Tournament. This was covered by Newsday, Newsday.com and News 12. Some of the latest agents to join Charles Rutenberg Realty were reported on by Newsday (2) and Long Island Business News (LIBN) (2) (3). GreaterPatchogue conducted an interview with BrickHouse Brewery's new chef. Charles Rutenberg Realty (CRRLI) continued to add agents over the past month. These announcements were reported in Long Island Business News' enewsletter, Long Island Business News and New York Real Estate Journal. Vox included Lobster Roll Restaurant in its East End's Top 10 Lobster Rolls article. Phyllis Ettinger of Royal Health Care Services and Paul Mertz of P&P Medicaid Consulting, Inc. were named as the "Ones to Watch in Healthcare” by Long Island Business News. Lobster Roll Restaurant was featured in Mommy Poppins. Joani Madarash of School-Business Partnerships of Long Island, Inc. was added to Newsday's list of "Winners" after being honored as SBPLI's Volunteer of the Year. American Recycler featured Gershow Recycling's donation of scrap parts to local robotics teams. Newsday and Patch.com reported on Dreamland Amusement's Long Island FunFest. FiOS1 reported on the FunFest's Father's Day special offer. 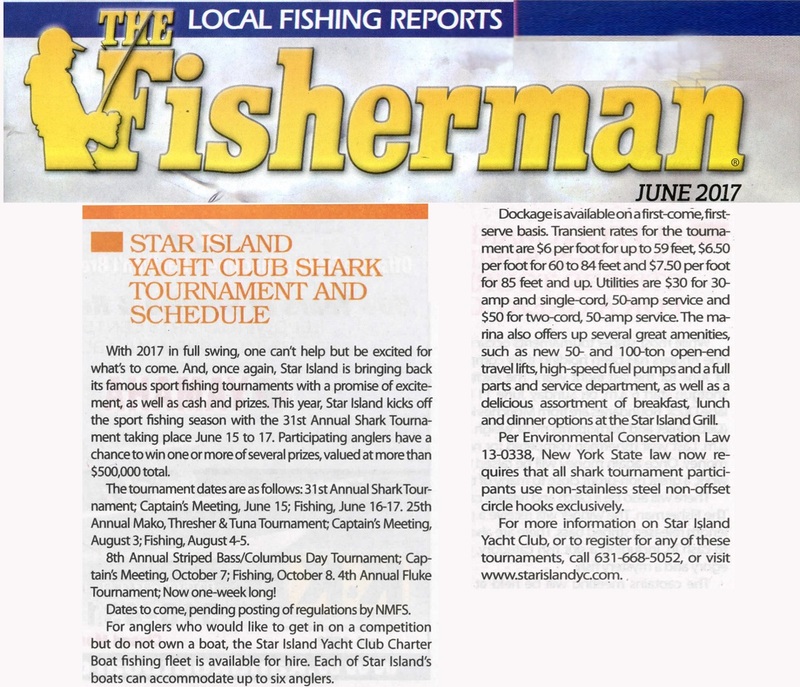 Star Island Yacht Club was mentioned in The Fisherman numerous times regarding the 31st Annual Shark Tournament, a list of upcoming tournaments and a profile on the marina itself. A preview of the 31st Annual Shark Tournament appeared in Newsday. The Sag Harbor Express reported on the results from the Shark Tournament. The Long Island Game Farm was featured on News12and News12's The East End. The Village of Islandia groundbreaking for the First Responders Recreational Ball Field was covered by Newsday and FiOS1. The Express Magazine wrote a feature article on the popular summer restaurant, Lobster Roll. Recycling Today reported on the environmental conservation scholarships awarded by Gershow Recycling for students at McGann Mercy, Riverhead, Lindenhurst, Bay Shore and Walt Whitman High Schools. Charles Rutenberg Realty of Long Island hired three new agents this month, which was covered in Newsday. Newsday reported on agent Susan McCoy's new 4-bedroom listing. 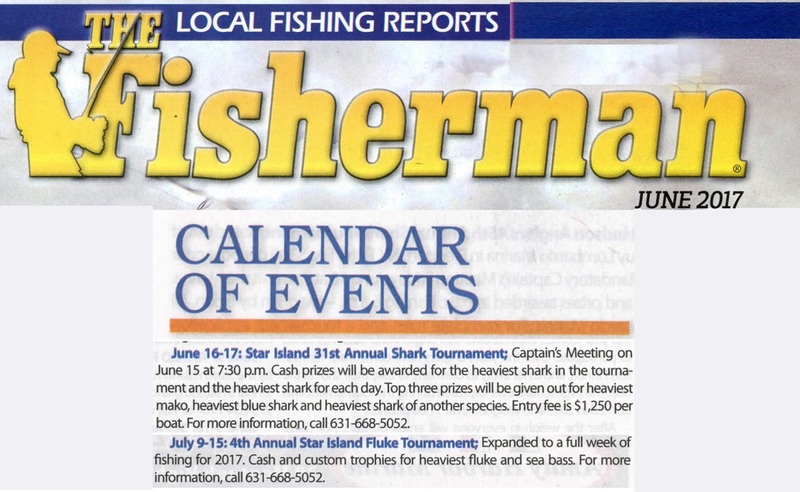 Star Island Yacht Club's upcoming fishing tournaments were featured in Newsday. 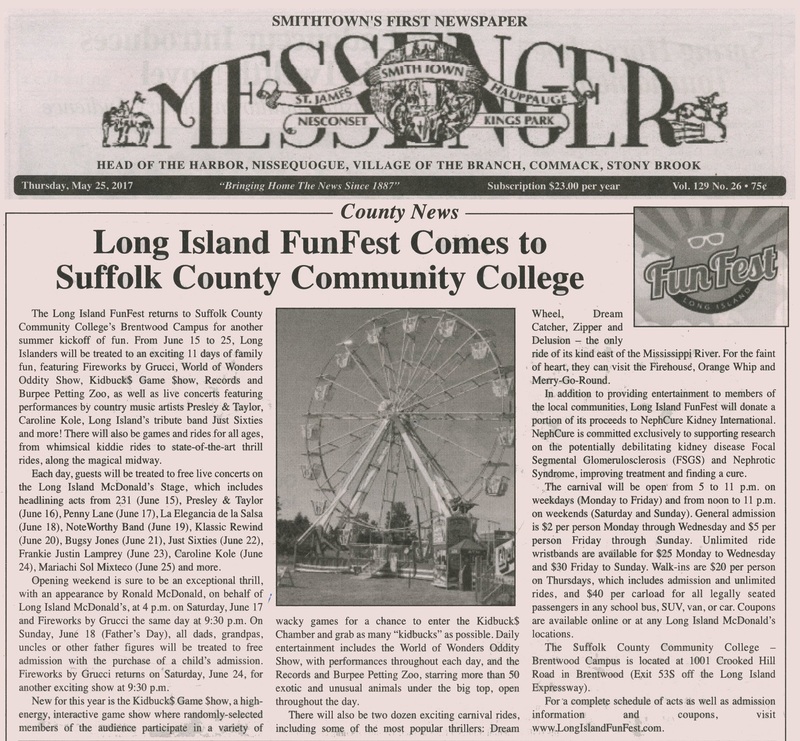 The Smithtown Messenger reported on Dreamland Amusement's Long Island FunFest. PRMG assisted the Northport Fire Department in publicizing the 10th Annual Chuck Varese Vehicle Extrication Tournament, in which Gershow Recycling donated the use of 30 vehicles. This was reported by FiOS1, The Long-Islander, The Northport Observer and Recycling Today. The Village of Islandia unveiled its replacement U.S. Marine Corps medallion in time for the Memorial Day ceremony. This was reported by Newsday, Newsday.com, News 12, FiOS1 and 1010 WINS Radio. Newsday reported that Daniel Mas, Ivy Johnson, Takiyah Thomas, Michael Karlen, Noelle Chetuck, Joan Borbee,Nicole Burke, and 7 others have been employed with Charles Rutenberg Realty of Long Island (CRRLI). Newsday also reported on agent Susan McCoy's new 4-bedroom listing. Charles Rutenberg hired 9 new agents last month. This news was covered in two Newsday articles. The Long Island Game Farm opened for its 48th season on April 13th. 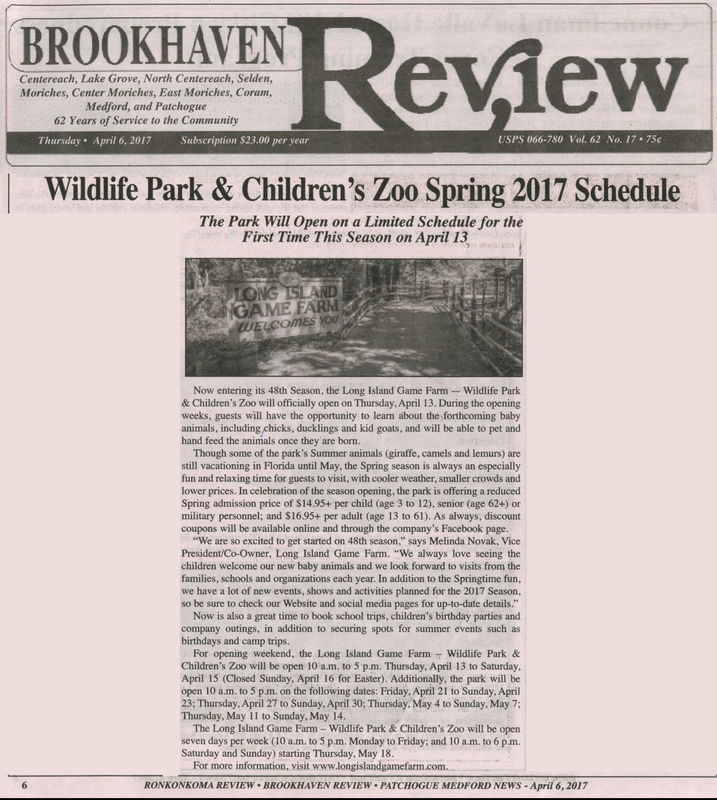 This news was covered by Neighbor Newspapers, NY Metro Parent, Trihamlet News and Brookhaven Review. The School Business Partnerships of Long Island (SBPLI) Our Lady of Mercy Academy all-girls competitive team advanced to the FIRST Robotics Championship (FRC), which was covered in Newsday. Long Island Weekly featured SBPLI in its Profiles in Education section. 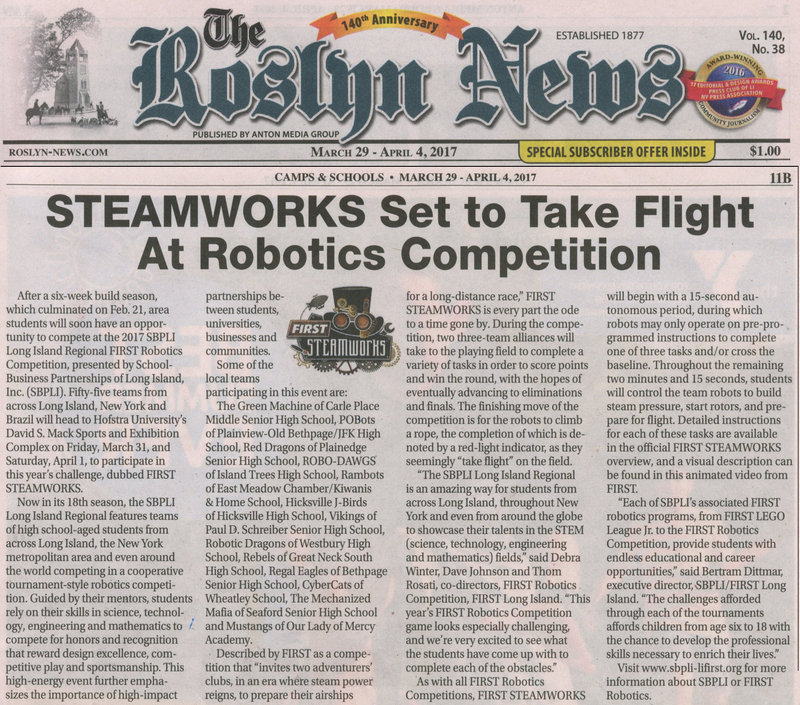 Roslyn News helped announce the 2017 FRC theme, STEAMWORKS. Scott Sanders of Sanders Thaler Viola & Katz was quoted in Newsday in an article about filing taxes in the 2017 season. Long Island Business News quoted Charles Rutenberg Realty of Long Island (CRRLI) owner Joe Moshé in an article about Long Island residential real estate. Members of CRRLI were appointed to the Long Island Board of Realtors (LIBOR). This news was covered by Real Estate Weekly. Central Veterinary Associates expertly answered a reader's inquiry on Long Island Herald.com. School-Business Partnerships of Long Island competitive robotics team the Rocky Point GearHeadz was highlighted in a TBR News Media article about their robot build for FTC. The Garden Department was featured in a Long Island Business News article about winter weather's effect on the gardening and landscaping industry. Ben's Kosher Delicatessen Restaurant & Caterers was featured in This is New York for their fantastic pickles on National Pickle Day. NewYork1 and The Times Ledger covered Ben's for their latkes and celebration of Hanukkah. Newsday Food highlighted Ben's "Kid's Meal Deal" in February and Westchester Magazine raved about their pastrami. 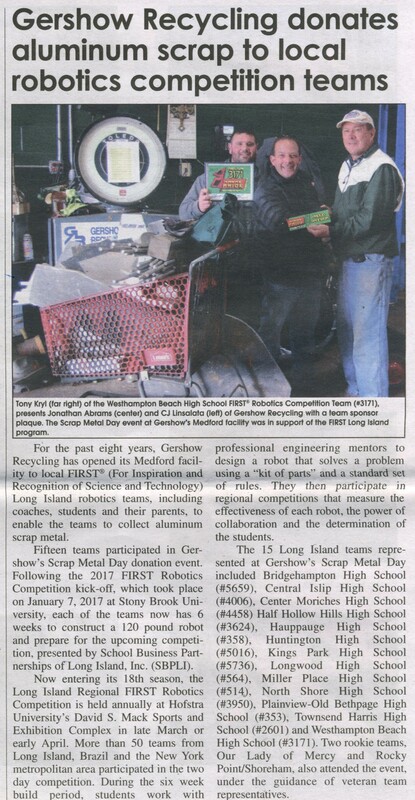 Gershow Recycling was featured in Recycling Today for supporting high school robotics teams with Scrap Metal Day. PRMG assisted Ben’s Kosher Delicatessen Restaurant & Caterers in handling media inquiries and managing the social media response to “A Day Without Immigrants." The restaurant was covered in Newsday, Long Island Business News, the Huffington Post, Food&Wine, The Daily Meal, The Slate, New York Magazine's 'Grub Street', CNN, The Forward and on Fios1. 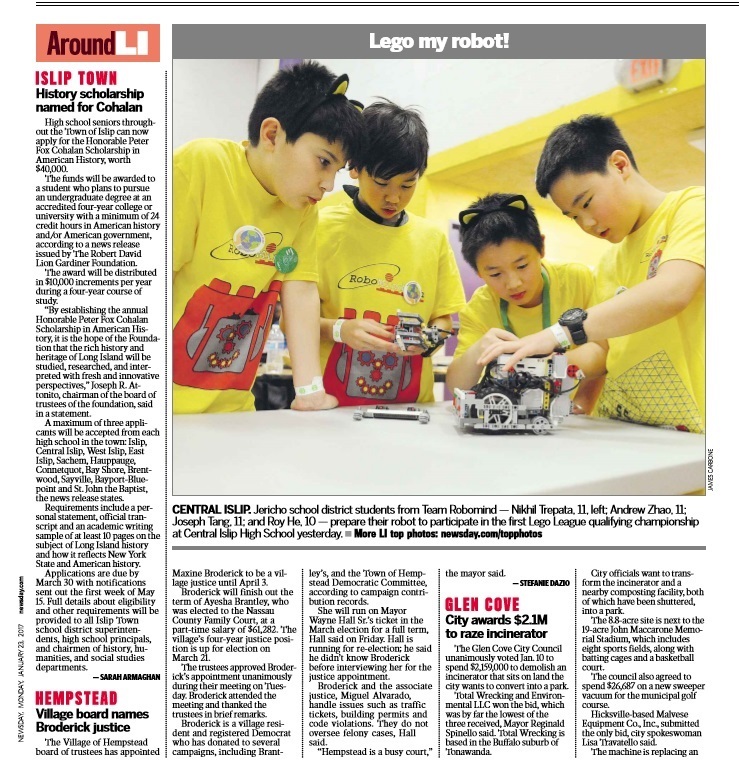 Newsday covered SBPLI's FIRST Tech Challenge, as well as FIRST LEGO League qualifying championship. 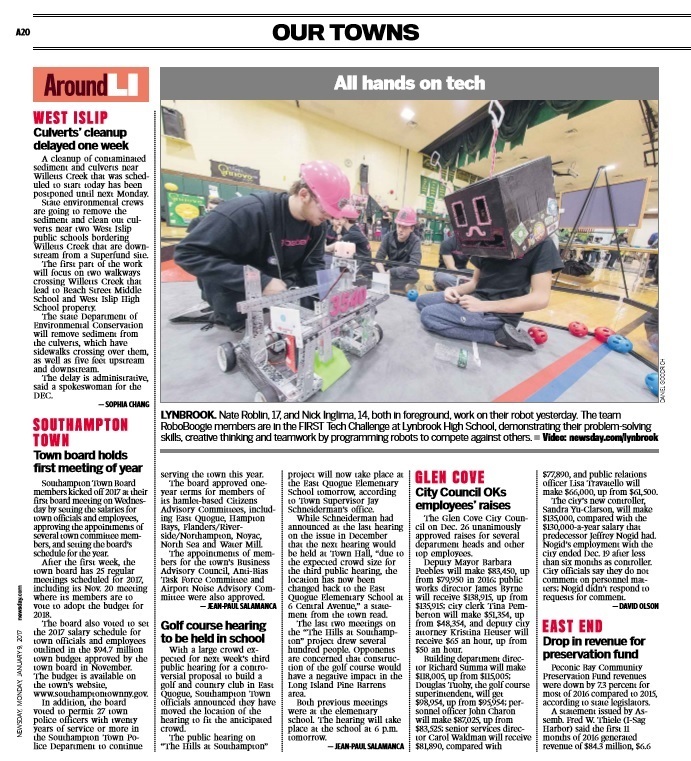 The FIRST Tech Challenge Scrimmage was featured in Newsday and Long Island Weekly. The New York Jewish Week wrote an article on Gurwin Jewish's Assisted Living Community's annual calendar. The Long Island Game Farm's famous giraffe, Clifford, was featured in Newsday's 'Kidsday' section, appearing in both in-print and online. Ben's Kosher Delicatessen Restaurant & Caterers recently hosted a book signing for author William Handwerker, which was covered in Long Island Jewish World. Ben's kosher Thanksgiving plates were mentioned in an article about the best local side dishes and an article about Thanksgiving deals. Ben's Jewish holiday specials and catering were highlighted in an article in The White Plains Examiner. An article on Charles Rutenberg Realty (CRRLI)'s owner Joe Moshé was published in Long Island Business News. Long Island Business News also reported on two of CRRLI's sales: the priciest home sales in Plainview and the quickest home sales in Freeport. The Port Times Record published a letter to the editor from Cause Café owner Stacey Wohl reaching out to local businesses for support. Cause Café was featured on Good Day New York with NY Giants football player Jay Bromley. Wohl and her staff were also named People of the Year by Times Beacon Record News Media. Gurwin Jewish held a reveal event for its Fifth Annual "L'dor V'dor" calendar at Huntington Cinema Arts Centre. The event was covered by The Huntingtonian, Long-Term Living Magazine, and The Jewish Press. Ben's Kosher Delicatessen Restaurant & Caterers recently hosted a book signing for author Willim Handwerker, which was covered in Long Island Jewish World. Ben's kosher Thanksgiving plates were mentioned in an article about the best local side dishes and an article about Thanksgiving deals. Ben's Jewish holiday specials and catering were highlighted in an article in The White Plains Examiner. Cause Café founder and owner Stacey Wohl wrote a letter to the editor for The Port Times Record. Gurwin Jewish Center recently published a calendar that features its residents. This was covered by The Huntingtonian, Long-Term Living Magazine, and The Jewish Press. AM New York featured Ben's Kosher Delicatessen & Caterers in an article about New York City Jewish delis. The Trip Directory noted The Long Island Game Farm as a must-see science exhibit. Charles Rutenberg Realty's 10th Anniversary was noted in the New York Real Estate Journal. US News & World Report interviewed Scott Sanders of Sanders, Thaler, Viola & Katz, LLP for an article on how to invest an inheritance in order to live comfortably during retirement. Camp Pa-Qua-Tuck was mentioned in an article on haunted houses on Patch.com. Edible Long Island published a story feature on Cause Café. Mary Smith, Practice Manager at Central Veterinary Associates (CVA), was honored as a Power Woman, an award which recognizes influential women in business. This was covered by QNS. Pop Sugar interviewed CVA's Dr. Frank DeFeis for an article on feeding your cat.